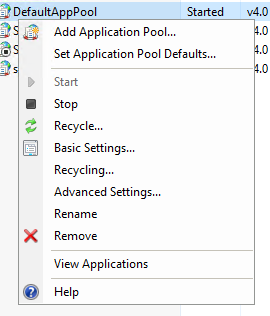 In IIS Manager, an application pool has checkbox for "Start application pool immediately" in the basic setting dialog, and an advanced setting called "Start Mode" which can be set to "OnDemand" or "AlwaysRunning". What is the difference between these settings? It looks like "Start application pool immediately" controls whether the application pool is "Started" when the World Wide Web Publishing service is started. But a "started" application pool is not necessarily running (meaning there may not be a w3wp process). If an app pool is not "started" then you will get a 503 when you hit a site that uses that app pool. If an app pool is "started" then a w3wp process will service your request. "Always Running" means that when the application pool is started a w3wp process starts. OnDemand means the w3wp process spins up when you first hit a website that is associated with the application (there is a delay while the w3wp starts). Bit late to respond but I will add my findings as I looked around to find asnwer to this same question. "OnDemand": IIS will launch worker process when first request for Web application is received. "AlwaysRunning": IIS Launches the worker process for the application pool as soon as IIS is started OR when application pool is created. Had the same question as the original poster but could not find a concise answer, below is the analysis from my research. Typically we see a single w3wp.exe instance running for each application pool but technically we can configure a web garden with multiple w3wp.exe instances running. Web gardens... are they good or bad or what? A worker process executes in the context of a single application pool. IIS will automatically start the application pool. Someone needs to manually start the application pool. If the application pool is running immediately start up the w3wp.exe process. 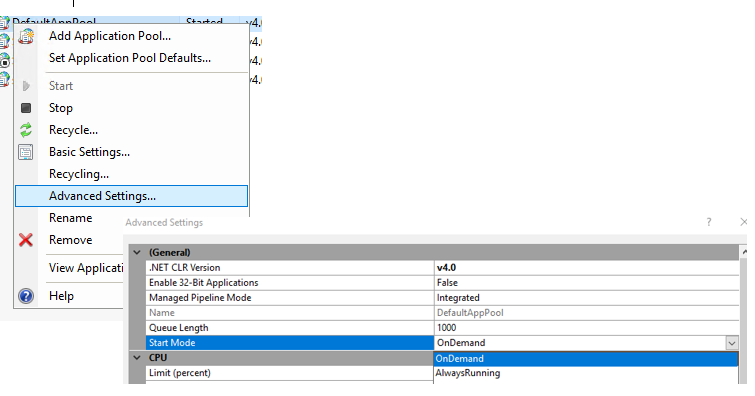 If the application pool is running start the w3wp.exe process when there is an inbound application request. Stop IIS, application pool(s) and worker process(es) (w3wp.exe instances). Start IIS and the above configuration settings will determine when the application pool(s) and worker process(es) (w3wp.exe) start up. Stop the web server from handling inbound requests but will not stop the application pool(s) or w3wp.exe process(es). Start the web server to handle inbound requests but will not start the application pool(s) or w3wp.exe process(es). AlwaysRunning vs. OnDemand will determined when the w3wp.exe process starts up. A few web applications take a significant amount of time to start up. IIS by default only launches a worker process when the first request for the web application is received. So for the web applications that require a longer time to initialize, users might see slow responses. For such applications it is a good idea to launch the worker process as soon as IIS is started. 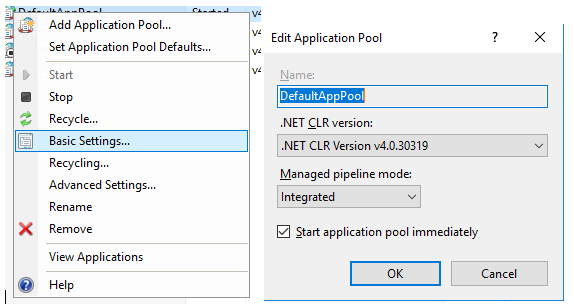 The application pools have a startMode setting which when set to AlwaysRunning launches the worker process for the application pool as soon as IIS is started. 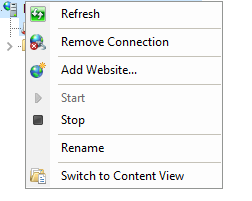 IIS 8 provides you this setting in the Application Pool Settings UI. Not the answer you're looking for? Browse other questions tagged iis asp.net-mvc or ask your own question. How do I prevent IIS 8 from stopping idle ASP.NET applications?